This is one of the main resources for my WIP, the sequel to Pantomime. In 1918 Harry Houdini performed a single illusion that has been hotly debated ever since: he made a live elephant disappear on stage. How did he do it? 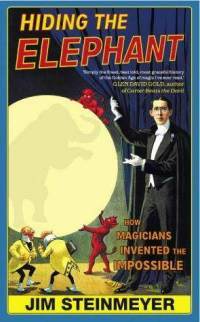 The answer lies in this dazzling tale of innovation, chicanery and keen competition that is the backstage story of the golden age of magic. Hiding the Elephant chronicles the race among history’s most legendary conjurers to make things levitate and disappear. A master illusionist and captivating storyteller, Steinmeyer introduces us to the eccentric personalities behind floating ghosts, disembodied heads and vanishing ladies and takes us backstage to reveal the mechanics of their mysteries. He carries us to a time when Queen Victoria held private seances and all of England believed in magic. I’d agree with Gold. The language and organisation of this book was perfect. I sank into it almost as I would a fiction book, which is high praise indeed. Steinmeyer obviously has such an overwhelming interest and love of magic, and that comes through the pages. It was fascinating to learn more about the greatest magicians of the age. Magicians are sneaky. Many of them had long-standing feuds, stole each other’s tricks and names, and found ways to slight each other. Some pretended to be from other countries to give themselves a more exotic air. Many of them became hugely successful, making relatively as much as an A-list celebrity would these days. But they were not easy lives, doing 2 or 3 shows a day 7 days a week for months sometimes, or traveling from city to city around the world. Another aspect of this book that makes it very interesting is that Steinmeyer explains some of the famous illusions shown onstage during the Golden Age of Magic. The Circle of Magic probably wasn’t very happy about that. But I find that learning the secrets behind the trick does not take enjoyment away. It makes me respect them all the more, for some of these are so complicated and require everything to be done just so. Even with the description and the diagrams, I still didn’t quite see how they could work onstage. If you have an interest in magic, this is an excellent starting point for an overview of the greatest era of magic.